Available in sizes 20" to 123"
We have over 100 years of experience in one award winning team. Let our marine taxidermists work closely with you to create the Black Marlin mount of a lifetime. 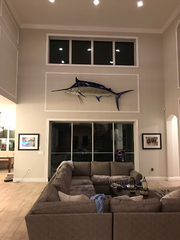 Our Black Marlin fish mounts are museum quality art pieces that look like LIVE FISH. The finest materials combined with highly skilled workmanship that will last a lifetime without discoloring or aging. 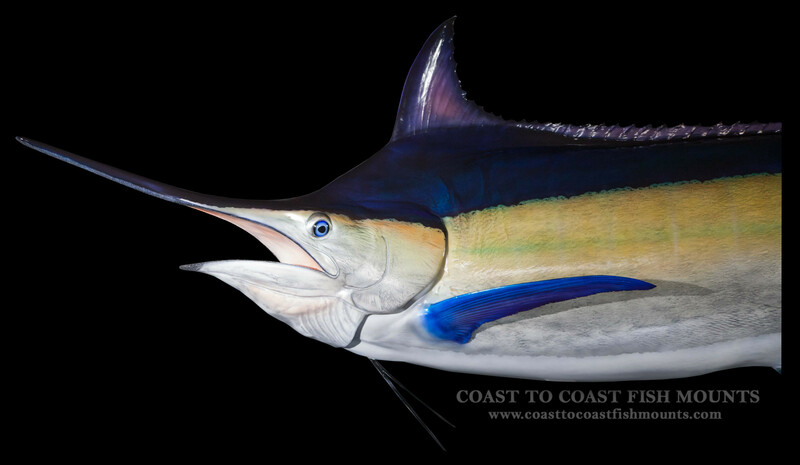 Striking anatomical posing as well as color accuracy holds the key to a meaningful Black Marlin fish replica. Our Black Marlin fish replicas are available in customer pleasing high action anatomical poses, as in traditional slight bend to the head, slight bend to the tail, swimming pose, leaping pose, tail walker, and rolling down poses. Open mouth, open gill, and complete inner mouth detail is standard. Available in sizes 20 to 123 inches. Weight/Length: With a maximum published length of 15.3 ft and weight of 1,650 lbs, the black marlin it is one of the largest marlins in the marlin family. Female black marlin are usually much bigger and longer than the male black marlin. The black marlin is also one of the fastest fish, with speeds nearing 80 mph. 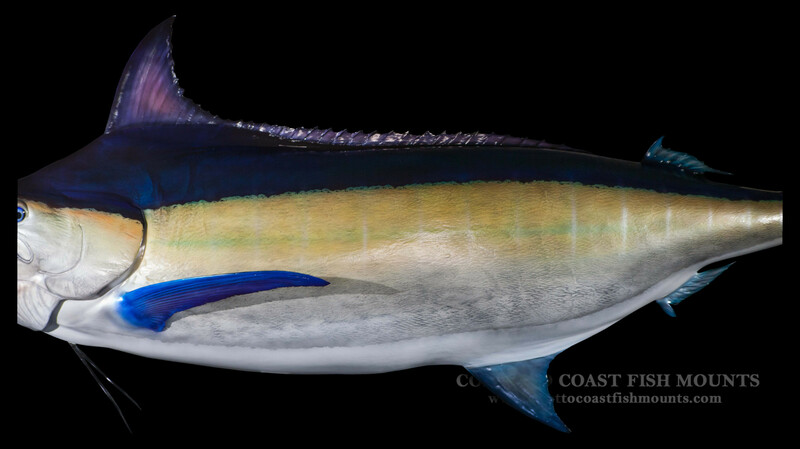 Black marlin are fished commercially and are also a highly prized game fish. Location & Habitat: Very much a migratory species, black marlins are usually found in tropical and subtropical areas of the Indian and Pacific Oceans and is often found close to the surface. Stray individuals may migrate into the Atlantic Ocean by way of the Cape of Good Hope. Physical description: Black Marlins look a lot like Blue Marlins however they have several differences including a comparatively lower and rounded dorsal fin, more rigid pectoral fins, and usually lack the stripes along the body found on the Blue Marlin. Black marlin are set apart from other marlin by their rigid pectoral fins. When the black marlin reach weights of approximately 150 lbs. they are unable to be pressed that pectoral fin flat against their sides, which makes it a characteristic of the black marlin. The black marlin is an impressive species. At Coast To Coast Fish Mounts we capture all the unique characteristics and colors that only your black marlin displays. 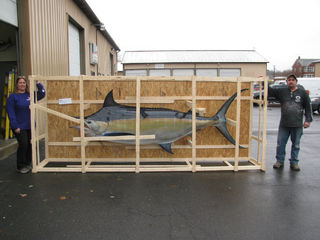 Our black marlin molds are cast off actual black marlin giving you a TRUE black marlin replica fish mount!